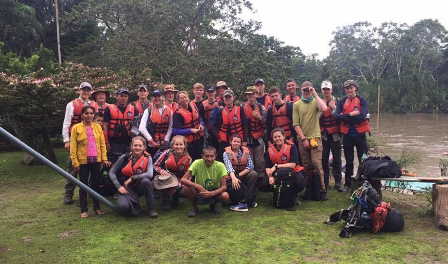 We were very pleased to help with Ben's expedition in Ecuador. "Our group, made up of 22 people from a variety of schools, departed from London Heathrow on the 10th of July 2017. We were all thoroughly excited but also apprehensive as we would soon be arriving in a beautiful but dangerous country. Firstly, we flew to Miami, America, (the flight was 10 hours) and stayed in Miami airport for 4 hours enjoying the healthy fast-food restaurants that Americans visit all too often. Unfortunately, as we embarked onto the plane that was taking us to Quito, Ecuador, a tropical storm erupted all around us and we were forced to wait on the plane for 3 hours before take-off. The flight to Quito lasted 4 hours and when we touched down in the Ecuadorian capital we could all feel the altitude (2,850 metres). We drove from the airport to a scout hut/compound which would be our base camp for the next two weeks. The next day was spent acclimatising and getting used to the altitude by relaxing and visiting the centre of Quito. Just walking up some stairs could leave you breathless and needing a glass of water. My job for the expedition was obtaining drinking water for the group. Lucy, Max and Harry also had the same job. At the start of the expedition we had been given four 20 litre water containers and purification tablets and we used this equipment to purify our water in the compound. After the rest days we started the 3 day rotation of activities. The first day was a rest day, the second a day of mountain biking and the third a day of climbing. 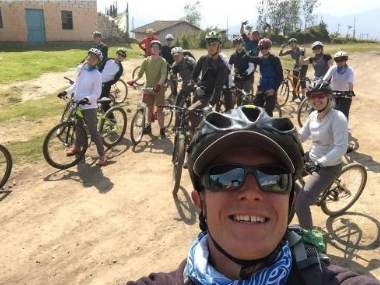 Over the two weeks that we stayed in Quito we spent many hours climbing/hiking and mountain biking. The climbs and bike rides became progressively harder after each one we did and by the end of the 2 weeks we were pushed to our limits. When we were climbing in the last week the mountains were tough and unforgiving with sheer drop-offs and loose rock near the summits. Luckily, we had very good mountain guides â€“ Rafael, Jorges and Gustavo to name a few. We reached the summit of Pasochoa (4,200 metres) and Pichincha (4,784 metres). We were all expecting to see lava in the crater of Pichincha as it is an active volcano but at the summit we couldnâ€™t see more than 20 metres in front of us due to thick clouds! However, when going back down the volcano we could run down the steep slopes as they were covered in soft ash and rocks. It felt like we were skiing as we had walking poles and were zig zagging down the volcano! We failed to reach the summit of Sincholagua (4,899 metres) and Iliniza Norte (5,126 metres) due to poor weather conditions (thick clouds, wind and snow) and a lack of visibility. Personally I preferred the mountain biking to the climbing as it was more thrilling due to the downhill sections of the rides. My favourite bike ride was the 2nd ride as we were riding downhill into a forest for almost 1 hour and a half. The track that we were on never seemed to end as it kept winding its way down and down and down into the valley floor. The bikes that we had been given were surprisingly durable as my bike and many others looked very old and clunky. On the last cycle, we had to wake up at 4:30am and we left the compound at 5:30am. We arrived at the starting place on our coach at 7am and before we left we visited Quilotoa, a two mile wide, water-filled caldera. After viewing this breath-taking crater, we started the cycle. It was gruelling. On the cycle I worked as hard as I ever have done before and I was pushed to my limits. This is why at the end of the cycle at 17:30pm (over 10 hours of cycling) I felt a great sense of achievement. At the end of the 2 weeks we only had one water container left as the other 3 had broken so we bought some very large bottles from the supermarket. Mr Hegarty also managed to rip a container off a water dispenser for us! After 2 fantastic weeks in Quito we travelled to Coca, in Orellana province which makes up part of the Amazon basin. The coach journey lasted 5 hours and when we arrived at the hotel we were pleasantly surprised; the hotel had an outdoor swimming pool, Wi-Fi and a restaurant. The following morning we walked into Coca and it was a bustling town full of basic concrete buildings and corner shops stocked with fresh fish and other products. Compared to Quito the locals seemed much poorer and less friendly (perhaps they werenâ€™t used to dealing with tourists). Soon afterwards, we embarked onto the dugout canoes with all of our kit. 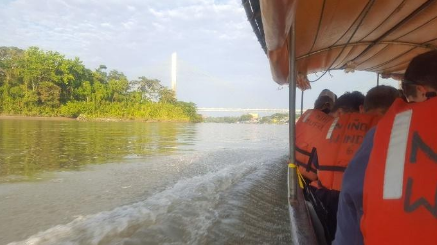 The journey down the Amazon River lasted 8 hours and was rather uncomfortable! The first campsite was teeming with exotic fruit and vegetables; chillies, lemons, pineapple and bananas! The first night in our tents was unbearable due to the heat and humidity and we all felt very tired the next day. Our next campsite was a clearing in the rainforest, next to the river. We stayed here for the next 2 nights and from this campsite we went on a jungle walk, fished for piranha, went swimming and went caiman hunting. After 2 nights, we packed up all of our gear and went upriver for 7 and a half hours back towards Coca. The campsite was on a very large sandbank in the middle of the river and it was truly stunning when the sunset went below the river. The best bit about the Amazon was the lovely food cooked by the guide and holding an anaconda and a caiman! The next morning we travelled back to Coca and then on to Santo Domingo (to the West of Quito) by coach. We spent 2 nights in a hotel there just resting. We then journeyed to Peurto Lopez on the coast. We spent the next 4 days in large beach huts, swimming in the sea, cooking over an open fire and relaxing. After the 4 days we travelled back to Quito and on one night we had dinner at the Hilton Colon (a very posh hotel). This was also where Mr Hegarty (the expedition leader) gave us a debrief and told funny stories which had occurred over the month being away. The following day we had a smooth travel back to Heathrow and were soon saying goodbye to the Gordons lot at Heathrow and everybody else back at Budmouth. My everlasting impressions of Ecuador are bustling towns, the beautiful landscape and the squalor. The expedition was a fantastic experience and I learnt many new skills. As Clive Burgees (another leader) once said â€œItâ€™s the people that make an expeditionâ€� and we had a great bunch of funny and determined people. I canâ€™t express how grateful I am for the John Thornton Young Achievers Foundation as they helped me to get on the trip. With the new skills that I have learnt on this expedition I will pass them on to young people as I continue to engage in activities like CCF and football."